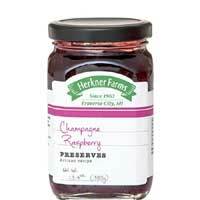 The Herkner family began creating their famous Cherry Drizzle Topping from the fruit they harvested on their farm on Old Mission Peninsula in Traverse City, MI in 1962. The popularity of these delicious toppings soon outgrew their farmhouse kitchen’s capacity and they began producing their products commercially for sale to customers, retailers and food and ice cream manufacturers throughout the Midwest. 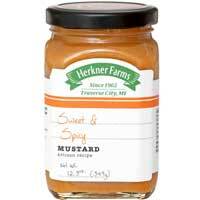 In 2015, the Herkner Farms brand added additional drizzle topping flavors including Blueberry, Cherry Chipotle, Cranberry, Peach, Peach Habanero, and Strawberry Drizzle Toppings. 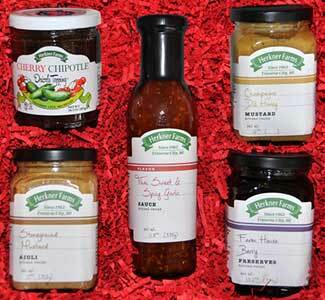 New product categories were also added consisting of Gourmet Condiments, Jams & Preserves, and Sauces. Gourmet Condiments include Balsamic Onion Roasted Garlic Spread, Champagne Dill Honey Mustard, Farm House Ketchup, Stoneground Mustard Aioli, and Sweet & Spicy Mustard. Jams and Preserves include Apple Cinnamon Jam, Champagne Raspberry Preserves, Farm House Berry Preserves, Raspberry Citrus Preserves, and Tropical Pineapple Jam. Sauces include Blackberry Balsamic Sauce, Cherry BBQ Sauce, Maple Chipotle Sauce, Raspberry Chipotle BBQ Sauce, Spicy Raspberry Peach Sauce, and Tai Sweet & Spicy Garlic Sauce. In 2017 Herkner Farms was honored by the food industry’s leading publication, Store Brands, with three medals from their annual “Editors Picks Best New Products” competition. The Cherry Chipotle Drizzle Topping won the gold medal, the Peach Drizzle Topping won the silver, and the Blueberry Drizzle Topping won the bronze. 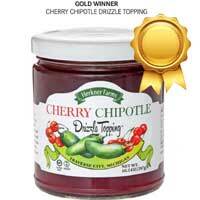 Herkner Farms is proud to have swept the “Toppings” category competition! Today, Herkner Farms continue to produce gourmet products with the same fresh, quality ingredients and care that the Herkner family has done for generations.